The Mariana Islands are a chain of islands stretching north to south in the northwestern Pacific Ocean. Guam is the largest and southernmost of the islands; Saipan, Tinian, and Rota are the other principal inhabited islands. The Marianas were colonized by Spain beginning in 1668, and they continued under Spanish control until the Spanish-American War of 1898. The U.S. captured and annexed Guam during that war, but Spain transferred all the other islands to Germany. Japan then seized the Northern Marianas from Germany in 1915, during World War I, and moved quickly to establish a naval base on Tinian. The U.S. captured the islands of Saipan and Tinian in very hard fighting in 1944, during World War II. After the war, the U.S. administered the Northern Marianas along with Palau and the Caroline and Marshall Islands as the Trust Territory of the Pacific Islands. In the 1970s, when the U.S. moved to grant independence to these territories, the people of the Northern Marianas decided instead to continue their association with the U.S. as a self-governing commonweath. An agreement in 1975 paved the way for the establishment of the Commonwealth of the Northern Mariana Islands (CNMI) in 1978. The capital of the CNMI is at Garapan on Saipan. There are no active lighthouses in the islands, but there is a historic Japanese lighthouse at Garapan and formerly there was a second one on Tinian. Nautical charts for the island can be viewed online. Chart 81067 covers Saipan and Tinian and Chart 81076 covers Saipan harbor. Date unknown. Active; focal plane 23 m (75 ft); continuous light, white, red or green depending on direction. Approx. 12 m (39 ft) post carrying a diamond-shaped black and white checkered daymark. No photo available but Google has an indistinct satellite view. This is the approach light for Saipan. Located on a small island on the north side of Saipan harbor. Accessible only by boat. Site status unknown. Admiralty M8364; NGA 10955; USCG 6-30865. Date unknown. Active; focal plane 16 m (52 ft); quick-flashing green light. Approx. 14 m (46 ft) round cylindrical white tower carrying a rectangular red daymark with a white vertical stripe. Google has a distant street view and a distant satellite view. This is the entrance range for the harbor. Located on the waterfront. Site status unknown. Admiralty M8366; NGA 10956; USCG 6-30875. Date unknown. Active; focal plane 38 m (126 ft); green light, 3 s on, 3 s off. Approx. 14 m (46 ft) round cylindrical white tower carrying a rectangular red daymark with a white vertical stripe. No photo available but Google has a distant satellite view. Located on a forested hillside 922 m (0.57 mi) east of the front light. Site status unknown. Admiralty M8366.1; NGA 10960; USCG 6-30880. 1934. Inactive since 1944. Approx. 15 m (50 ft) concrete tower rising from a 1-story concrete keeper's quarters. Paul Sturm has posted a portfolio of photos, including the one above. Wikipedia has an article on the lighthouse, and Google has a street view and a satellite view. The lighthouse, now abandoned and open to the elements, is one of several built by Japan to guide its ships to its bases in the central Pacific prior to World War II. A photo and a second photo show the heavy damage the lighthouse suffered during the three-week Battle of Saipan in late June and early July 1944. However the U.S. Navy's 117th Naval Construction Battalion quickly restored the lighthouse so that it could be used as a signal station; Michel Forand has posted a photo of the restored building. The building was renovated and expanded in the early 1990s as a restaurant, but it has been abandoned since 1995 and is in increasingly poor condition. Gravely endangered. 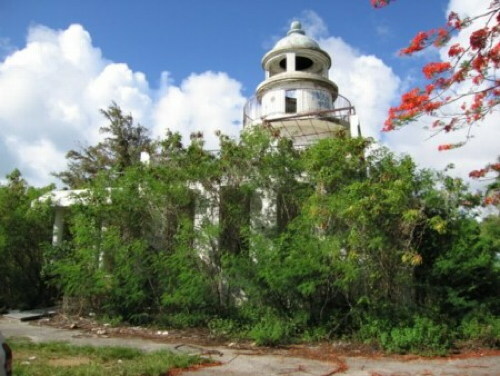 Sturm and other island residents formed the Saipan Lighthouse Historical Society to work for its restoration. For a time, volunteers met regularly to clean up the lighthouse and fix what they could. However, Eric Johnson's June 2009 photo and Kerry Hill's August 2011 photo show no major change in the building. In 2010 Congress appropriated $192,000 for an engineering study of the lighthouse as the proposed visitor center of the newly-created Mariana Trench Marine National Monument. However, it appears that the building is too small for this purpose. In 2016 the dome fell from the tower during a storm. In August 2017 a resident (D.C. Cook) wrote in a local newspaper that he was interested in attempting to restore the lighthouse once again as a restaurant, if investors could be found. The lighthouse was placed on the U.S. National Register of Historic Places in 1974. Located on the highest point of Navy Hill behind the town of Garapan, the capital of the Northern Mariana Islands, on the western side of Saipan. Site and tower open. ARLHS MAI-001. Tinian (1930s). This was an 11 m (36 ft) square concrete tower. A photo and a smaller version of the same photo are available, but nothing is seen in Google's satellite view of the location, about 2 km (1.2 mi) south of the Sunharon waterfront. As far as we know, nothing survives of this lighthouse: but we need a report from a visitor! Posted August 28, 2005. Checked and revised February 27, 2019. Lighthouses: 3. Site copyright 2019 Russ Rowlett and the University of North Carolina at Chapel Hill.